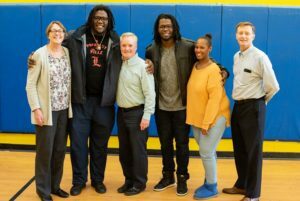 On January 3, the kids at Covenant House had quite an exciting afternoon: not only did they receive winter coats courtesy of United Healthcare, but Jamon Brown, guard for the New York Giants, delivered them in person! The United Healthcare team stopped by in the afternoon along with the NFL player and his brother. 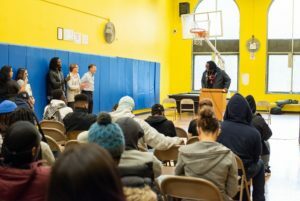 Brown and United Healthcare’s president, Michael McGuire, said a few words of encouragement before handing out the coats, which came in various different colors and sizes to accommodate all of our young people. The youth at CHNY enjoyed speaking with Brown, who recently joined the Giants in October. He spent time answering their questions and getting to know them before, during and after the coat giveaway and shared some of his own personal experiences about overcoming adversity. We’re so grateful for United Healthcare’s generous donation and Brown’s kind words — both will certainly help keep our kids a little warmer this winter season.